The Conservative Party has published a list of wealthy individuals and companies to whom it owes £15.95m in total. Chairman and chief executive of sporting goods manufacturer Head and former deputy treasurer of the Conservative Party. On the advisory board of the Centre for Social Justice, a think-tank set up by former Conservative Party leader Iain Duncan Smith. 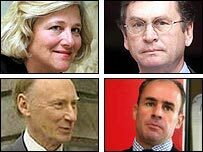 He is among the four Tory donors to have been interviewed by police in the "cash for peerages" inquiry. Party treasurer from 1998 to 2001, under William Hague. Ranked 54th in the Sunday Times Rich List 2005, with an estimated personal wealth of £797m. He too has been questioned by police. Businessman and founder of the Institute for International Research, who received a peerage in 2004. According to the Sunday Times Rich List 2005, Scotland's sixth richest man, with an estimated wealth of £498m. He is also among those interviewed by police in July. A former Australian army officer. His London-based hedge fund firm, CQS Management, made about £60m last year. Founder and chairman of Stanley Leisure casino group. Awarded a peerage in 2004. Investment banker and former director of the Institute of Directors, and a member of the Court of the Guild of International Bankers. Donates and loans money to the Conservatives through City firms Flowidea and Wyler Investments. Estimated wealth at least £30m. Chairman of the Royal Opera House Endowment Fund and a Governor of the Royal Ballet and Royal Ballet School. Former chairman of the CBI Initiative for Europe. Retired farmer and Conservative councillor. A party treasurer from 2001 until 2006. Bob Edmiston, head of IM group, also lent the Conservatives £2m but he later converted the loan into a donation. He was interviewed by the police in July.